How is it possible that I have been doing this for almost four years and I have never done a piece on Dinosaurs?? It was an ABC series that ran for four seasons, though it ended with just 65 episodes (the fourth season didn't come until eleven months after the third ended, and half of that final season only aired in syndication). But, the show (created by Jim Henson) was WONDERFUL! I didn't completely understand how primetime worked when it began (after all, I was in first grade), but I tuned in whenever I could, and late found the reruns on Disney to be enlightening in many ways. But first, I imagine that many of you might have never saw this gem, though perhaps you are at least aware of Baby Sinclair's "not the mama!" and "I'm the baby, gotta love me!" catchphrases. So, let's get into the basics.... in a nutshell, the show revolved around a tree-pushing father (Earl), a homemaker mother (Fran), their teenage son (Robbie) and daughter (Charlene), and their toddler (Baby). Other major characters include Fran's mother (Ethyl) who comes to live with them after she turns 72 years old, Earl's best friend (Roy), Fran's best friend (Monica, who also happens to be the first divorced dinosaur), and a rough-around-the-edges friend of Robbie's (Spike). I know some people felt the show was a never-ending "after-school special," but I thought it did a great job of covering a variety of topics. From Robbie trying "steroids," becoming a vegetarian, and experimenting with "drugs," to Charlene "getting her tail" and "scent," I wasn't disappointed. Plus, the show dove into larger problems including "racism," censorship, sexual harassment in the workplace, and even war. There are some strange things with the names in this episode, with a bunch of the surnames being petroleum companies (Sinclair, BP, Hess), some sibling names rhyming (Earl and Pearl, Stan and Fran), and Baby being known as "ahh ahh I'm dying you idiot" for a short time, but let's not let those bring down the series. 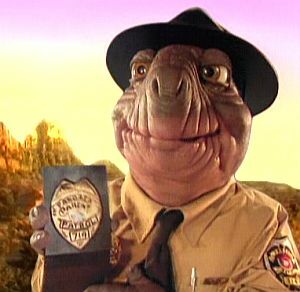 I really enjoyed the show, and despite the fact that they were from another species and another time, I found it pretty easy to relate to the Sinclair family. So, let's get to my favorite episodes! Season 1: "High Noon" (S01E04): This is a short season, only five episodes, so it wasn't all that difficult for "High Noon" to stand out. Here, Fran meets a nice dinosaur at the grocery store and he decides to challenge Earl for Fran. The problem is, Gary is a 50-foot dinosaur, so Earl doesn't stand much of a chance. Fran tries to get Earl to run away, but he decides to fight for his family. 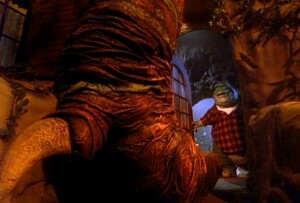 After Earl attacks Gary's foot, Fran decides to just tell Gary to go away, and he does. Season 2: "Slave to Fashion" (S02E22): Charlene is desperate to be popular, so she begs Early for the money to buy an expensive coat, nicer than the ones everyone else is wearing. He won't give in, but Grandma Ethyl gets the coat for her! At first, Charlene's dream has come true, but because the coat is alive, the snarky creature soon begins to alienate her from everyone, particularly her best friend, Mindy. Season 3: "License to Parent" (S03E08): This was a hard pick for me, as I think that this is the best season. But, "License to Parent" stands out over all of the others because I initially found the concept to be incredible... mothers and fathers could lose their "licenses" to parent if they were bad at it. Now, I understand that it was really more of a DCF-type thing, but it's such an amusing episode to watch, regardless. Anyway, Earl loses his temper at Baby too many times, so he loses his parenting license. He tries to regain it, but he flunks the test and has to wait 30 days to try again. This forces a "Parent Patrol" officer to move into the house. and observe Earl. Well, Earl repeatedly points out that Fran doesn't parent "by the book," either, and she also loses her license. But, the Parent Patrol have their hands full with Robbie, Charlene, and Baby, and after a gun is pulled on the children, Fran and Earl risk whatever it takes to rush in to save them. Well, the guy doesn't want it getting out that he pulled a gun, so he gives the Sinclairs back their licenses. Season 4: "Driving Miss Ethyl" (S04E04): Against his wishes, Earl drives Ethyl to her 60th high school reunion, only to discover that nobody else showed up... she's likely the only survivor at this point. Though Earl normally fights with his mother-in-law, he feels bad that all of her friends (including Dorothy, Rose, and Blanche!) have passed away. While they're away, Fran tries to get a good portrait of the kids to give Earl for his upcoming birthday, but of course they have other things on their minds. 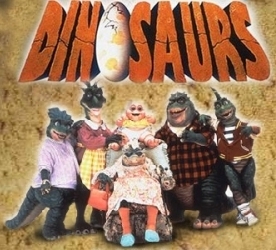 Do you have favorite episode of Dinosaurs? Share 'em!